Now we are ready to start cooking our healing soup.Firstly, you need to prepare (download and install) the Gallery2 product. Make sure it’s fresh (working fine). 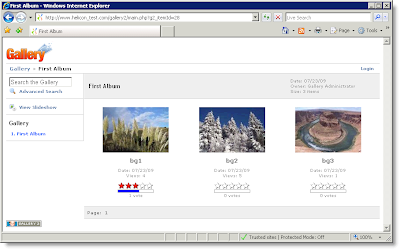 Next, we need to create a link to this gallery on our IIS7-driven site (we put it on the main page). That’s the component we’ll experiment with today. 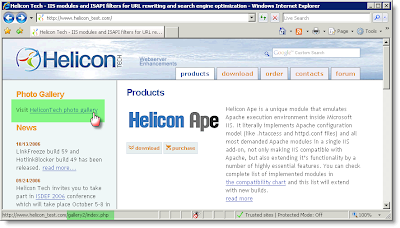 Take a species mix called Helicon Ape from the shelf and be ready to use it in a moment (install Helicon Ape).Take a pinch of mod_hotlink species and add it to the pot (just uncomment one line). to feel the most delicate notes of taste (to enable links replacing mechanism). After that the aroma (link to Gallery2) will change for the better (a dynamically generated signature will be appended). Now all links from our site pointing to Gallery2 folder are dynamically signed and the signature is unique for each client (individual approach to each person is a key to success! ), i.e. there’s no way to get the content without this signature or fabricate it (the recipe is our top secret!). Everyone who behaves badly and is not allowed to taste the dish or who tries to guess it’s components (everyone who attempts to access protected resource with incorrect signature) will get 403 Forbidden response or will be turned out – redirected to the specified URL (RedirectURL parameter). That is, mod_hotlink makes sure the user obtined the link from our site only (authentic and inimitate one, made acoounting for his preferences). And we have nothing to do with the site – all links on pages are transformed automatically on the fly (as if prepared in a microwave oven)! 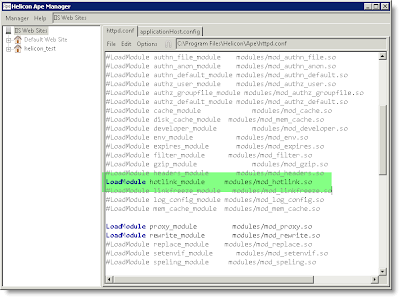 Ok, let me see… Mmmm… Today our mod_hotlink-based dish is particularly delicious. This entry was posted in Helicon Ape and tagged CodeProject hotlinking mod_hotlink. Bookmark the permalink.